Market was a bit slow this past Saturday with the unrelenting rain most of the morning. I had lots of lovely white and purple eggplants left so I’m going to make baba ghanoush. No matter how you spell it, this creamy garlic- and lemon-spiked dip (frequently served as part of a mezze platter in Middle Eastern countries) is a delightful and simple dish to prepare when eggplants are abundant. I started with my bookshelf on Eat Your Books to survey recipes…most were very similar. 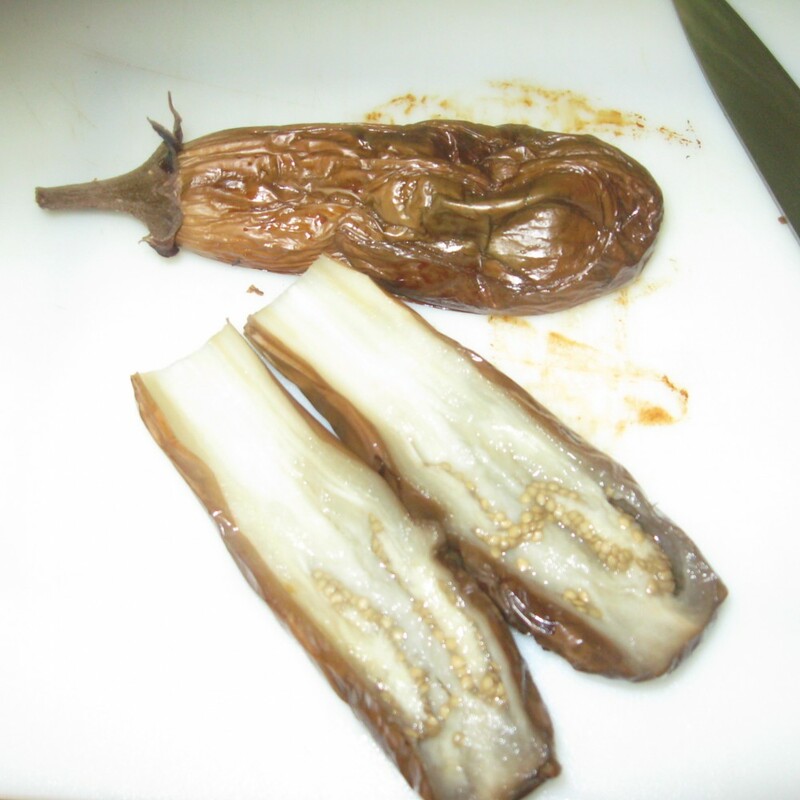 The biggest differences were in the preparation of the eggplant. Since I have a penchant for those that explain the whys of the recipe, I elected to use one from Perfect Vegetables (from the editors of Cook’s Illustrated magazine. 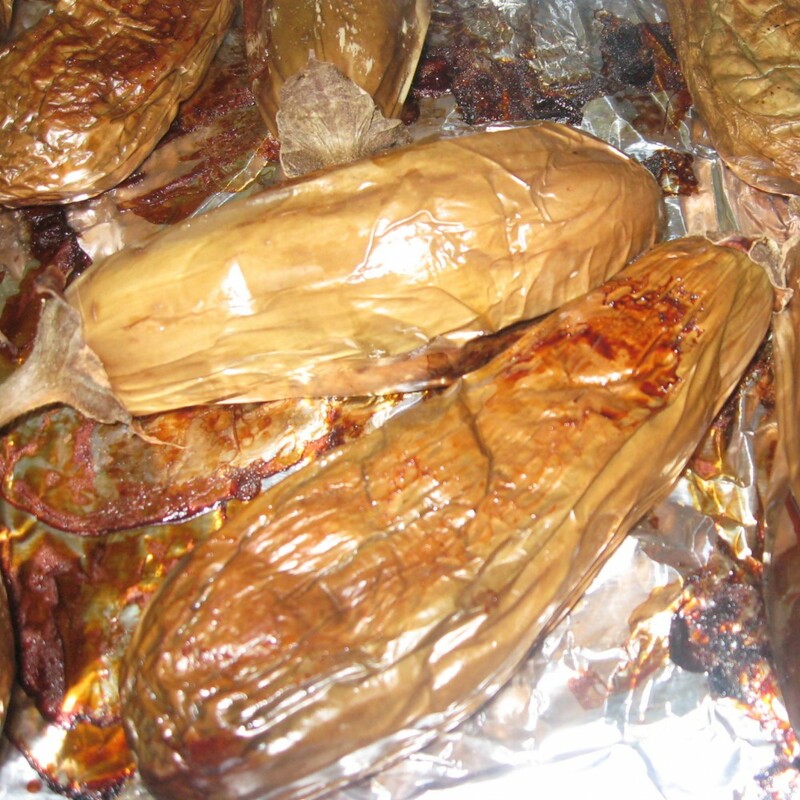 That recipe noted that the eggplants must be more than just soft–they needed to be cooked until the insides were “sloshy”. This can be done on the grill (preferable) or in the oven (acceptable alternative). Broiling seemed not to be an option as the outsides would be charred too much and the insides not sloshy. 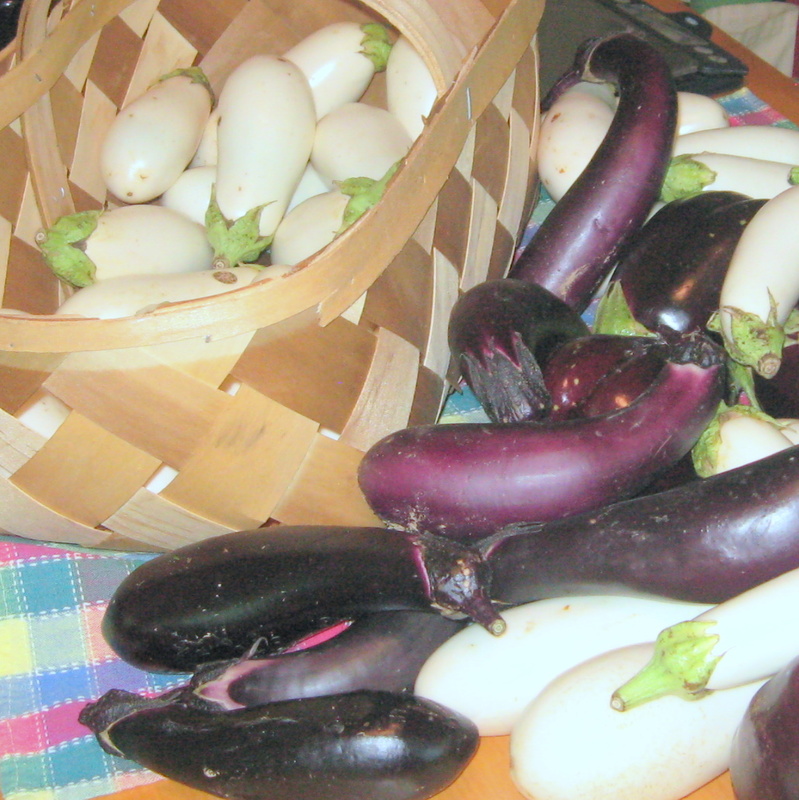 See “Eggplant….” for how to select appropriately mature eggplants of good quality. 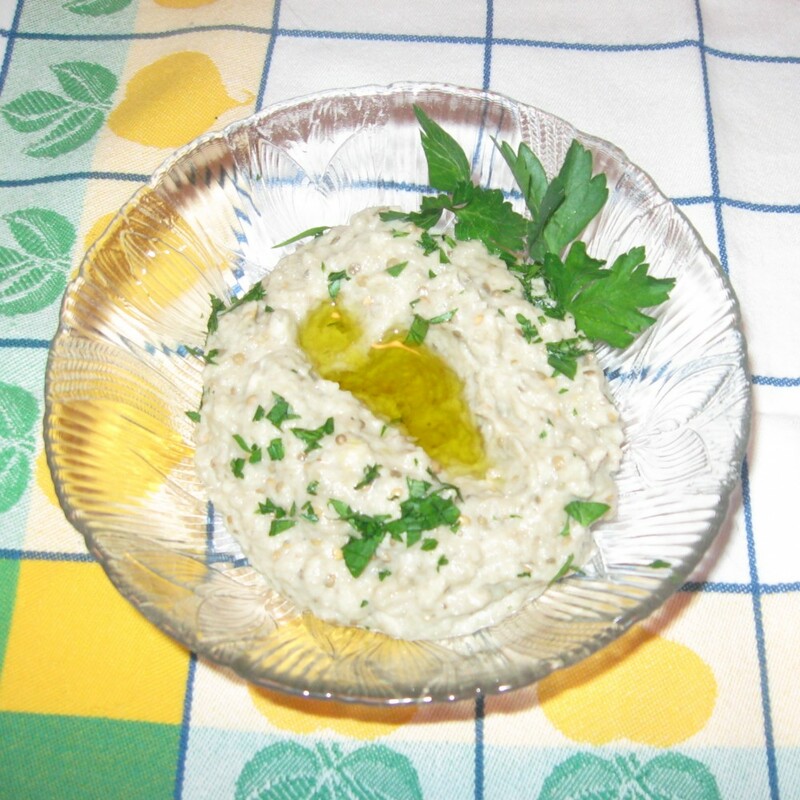 This recipe is adapted from Perfect Vegetables, page 105 (Master Recipe for Baba Ghanoush). I used white eggplant to make this batch of baba ghanoush–they are proported to be sweeter than purple ones. Roast on the middle rack of the oven preheated to 500 ° F, turning every15minutes. 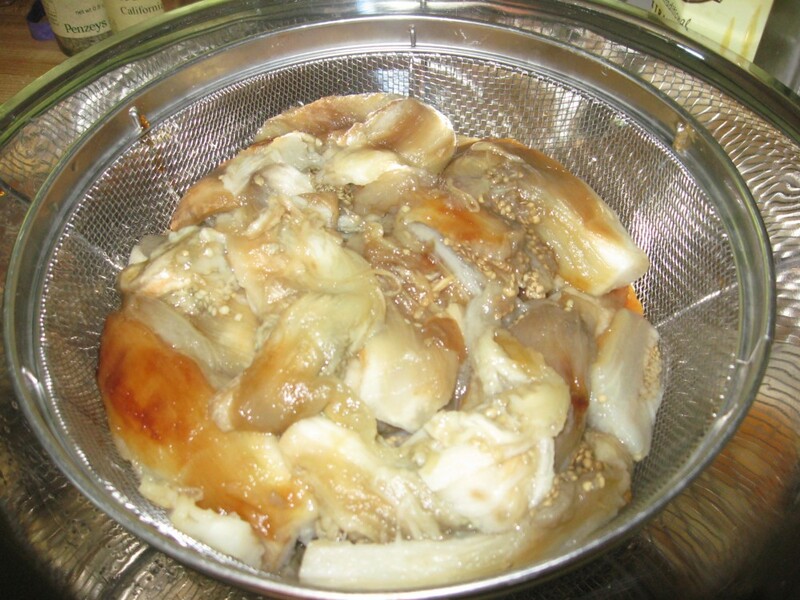 (Globe eggplants, about 60 minutes; Italian eggplants, 50 minutes; oriental/Japanese eggplants 40 minutes). Let cool until you can handle them. The eggplants should be more than just soft–they should be squishy (or sloshy as described in the recipe) after the roasting. Transfer the pulp to food processor bowl. Add lemon juice, garlic, tahini, oil, 1/4 teaspoon salt, 1/4 teaspoon pepper. Process using 1-second pulses (about 8 to 10) until the pulp has a coarse, chopped texture. Adjust seasoning as needed. Transfer to serving dish or storage container, covering the surface with plastic film and chill lightly (about 45 to 60 minutes) before serving. Baba ghanoush is typically served as part of a mezze platter (or like Italian antipasto) with pita bread, but crudities (peppers, cucumbers, small tomatoes, celery, et cetera) can be used as well to dip as well. If the baba ghanoush has been thoroughly chilled, the flavor will be best if it is allowed to warm slightly before serving. Sprinkle with chopped/minced parsley. Make a depression in the center and add a bit of extra-virgin olive oil. 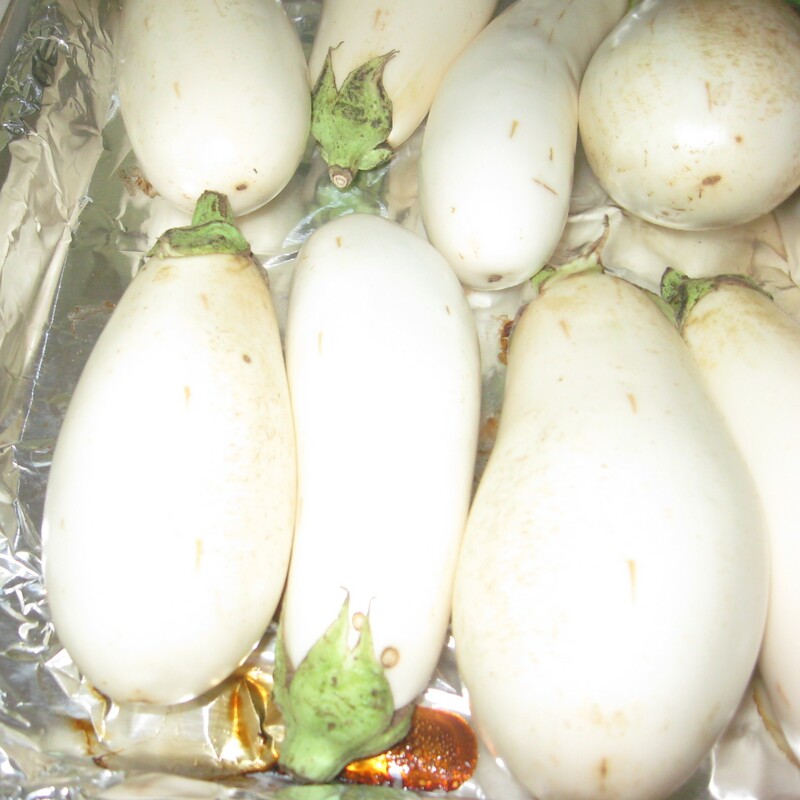 I did find that the white eggplant have more body and take longer to roast than comparable size purple ones. The flesh is, indeed, sweeter than purple ones, so I added just a bit of extra lemon juice to the baba ghanoush than the recipe called for. I think that I prefer the white eggplants for slicing or using whole as they do seem sturdier and to have a bit more “tooth” to them. I prefer a bit more garlic and lemon than this recipe calls for, as well as a pinch of cayenne pepper–not enough to be hot–just as a flavor enhancer. If you like really lemony flavor, use a microplane grater or zester to get some very fine zest and add just a bit to give it a real lemon kick.